Particles are injected from a system of injection nozzles into a CVD chamber with a cone angle of 15 degrees. Initially they have enough inertia to follow their original trajectory but ultimately the drag force takes over and the particles begin to follow the background gas out of the exhaust port. 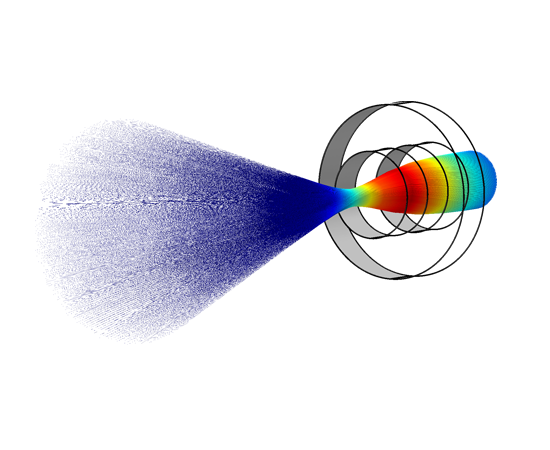 The Particle Tracing Module extends the functionality of the COMSOL environment for computing the trajectory of particles in a fluid or electromagnetic field, including particle-particle, fluid-particle, and particle-field interactions. You can seamlessly combine any application-specific module with the Particle Tracing Module for computing the fields that drive particle motion. Particles can have mass or be mass-less. The movement is governed by either the Newtonian, Lagrangian, or Hamiltonian formulations from classical mechanics. Boundary conditions can be imposed on the particles on the walls of the geometry to allow particles to freeze, stick, bounce, disappear, or reflect diffusely. User-defined wall conditions may also be specified, where the post collision particle velocity is typically a function of the incoming particle velocity and the wall normal vector. Secondary particles released when an incoming particle strikes a wall can be included. The number of secondary particles and their velocity distribution function can be functions of the primary particle velocity and the wall geometry. Particles can also stick to the wall according to an arbitrary expression or a sticking probability. Additional dependent variables can be added to the model which allows you to compute quantities like particle mass, temperature, or spin. Particles can be released on boundaries and domains uniformly, according to the underlying mesh, as defined by a grid or according to an arbitrary expression. A wide range of predefined forces is available to describe specifically how the particles interact with the fields. You can then add arbitrary forces as defined by a suitable expression. It is also possible to model the two-way interaction between the particles and the fields (particle-field interaction), as well as the interaction of particles between each other (particle-particle interaction). Static mixers, also known as motionless or in-line mixers, are pipes containing stationary blades that mix fluids as they are pumped through. This type of mixing technique is great for laminar flow mixing as the pressure losses it generates in this flow regime are small. The example shown here studies the flow in a static mixer containing twisted blades. The mixing performance is evaluated via the calculation of the suspended particles' trajectory through the mixer. The model uses the Laminar Flow and Particle Tracing for Fluid Flow interfaces. This model simulates the mixing of particles in a rotating micromixer. The mixer contains three distinct inlets and one outlet. The Rotating Machinery interface is used to model the fluid flow, and the Particle Tracing for Fluid Flow interface computes the particle trajectories. Solid particles are carried by a fluid through a 90° pipe elbow. The particles' inertia and turbulent dispersion in the flow can cause them to impinge on the pipe walls. In this model, the rate of erosive wear on the pipe wall is computed. A scanning electron microscope samples images by scanning a target with a high-energy beam of electrons. The subsequent electron interactions produce signals such as secondary and back-scattered electrons that contain information about the sample surface topography. Electromagnetic lenses are used to focus this electron beam down to a spot about 10 nm wide on the sample surface. This model requires both the Particle Tracing Module and the AC/DC Module. The principle component of a quadrupole mass spectrometer is the mass filter that is used to filter ions with different charge-to-mass ratios. The quadrupole mass filter has been well-studied over the years, and the physics and optimal design are well understood. In a real quadrupole mass spectrometer, fringe fields exist at both the entrance and exit of the mass filter. These fringe fields can play an important role in determining the transmission probability of a specific ion through the mass filter. 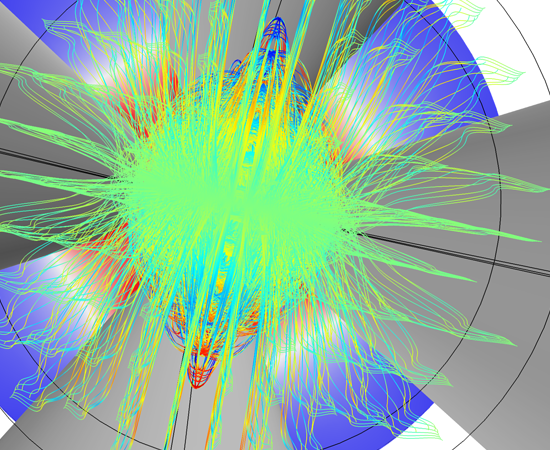 This model computes the ion trajectories in a quadrupole mass spectrometer, including the effects of fringe fields. Trajectories of protons in Earth's magnetic field. Three types of oscillatory motion can be observed on three different time scales. 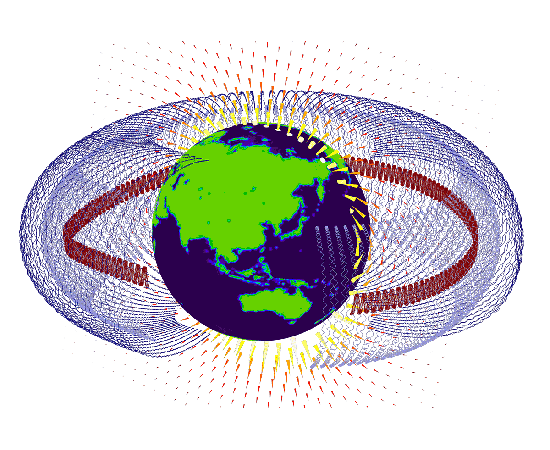 On the shortest time scale, protons follow helical paths around Earth's magnetic field lines. At the intermediate time scale, these helical paths alternate between the magnetic north and south poles as the proton approaches latitudes known as mirror points, which are a function of the equatorial pitch angle. On the longer time scale, these oscillating trajectories precess around Earth from east to west due to asymmetries in the magnetic force. Powerful processing tools allow for sophisticated visualization of the computed particle trajectories. Particle trajectories can be represented by points, comet tails, arrows, lines, tubes, or ribbons. Animations can easily be created and viewed directly in the graphical user interface (GUI) or exported to file. The particle trajectories can be colored with arbitrary expressions that can depend on the particles, the fields, or any combination of the two. In cases where the trajectory of many particles are simulated, it is possible to filter out specific particle trajectories according to a logical expression. The group behavior of the particles can be projected onto a lower dimension and visualized using Poincaré maps or phase portraits. It is also possible to perform operations on the particles to compute and plot the maximum, minimum, average, or integral of some quantity over all the particles. The particle trajectory data itself can be evaluated and written to the Results table or exported to a file. You can conveniently visualize the velocity and energy distributions of the particles, using 1D or 2D histograms. The electric force, which arises either due to a gradient in the electric potential or due to a time-varying magnetic vector potential. Particles with negative charge move in the opposite direction to the electric field, and particles with positive charge move in the same direction as the electric field. The electric force does work on these particles. The magnetic force, which does no work on the charged particles but can significantly alter their trajectory. The magnetic force often results in “banana” orbits for charged particles, causing them to orbit around magnetic field lines with a distance proportional to their mass. Collisional forces, which occur when charged particles collide with a background gas. The higher the background pressure, the more important the collisional forces. If the number density of charged species is less than around 1013 1/m3, the effect of the particles on the fields can be neglected. This allows you to compute the fields independently from the particle trajectories. The fields are then used to compute the electric, magnetic, and collisional forces on the particles. The fact that the particle trajectories can be computed in their own study allows efficient and computationally inexpensive iterative solvers to be used. For each particle, an ordinary differential equation is solved for each component of the position vector. This means that three ordinary differential equations are solved for each particle in 3D, and two in 2D. At each time step, the forces acting on each particle are queried from the computed fields at the current particle position. If particle-particle interaction forces are included in the model, they are added to the total force. The particle position is then updated, and the process repeats until the specified end time for the simulation is reached. Since the Particle Tracing Module uses a very general formulation for computing particle trajectories, the Particle Tracing interfaces can be used to model charged particle motion in electromagnetic fields, large scale planetary and galactic movement, and particle motion in laminar, turbulent, and two-phase fluid systems. The motion of microscopic- and macroscopic-sized particles is typically dominated by the drag force acting on particles immersed in a fluid. There are two phases in the system: a discrete phase consisting of bubbles, particles, or droplets, and a continuous phase in which the particles are immersed. In order for the particle tracking approach to be valid, the system should be a dilute or dispersed flow. This means that the volume fraction of the discrete phase should be much smaller than the volume fraction of the continuous phase (generally less than 1%). When the volume fraction of the particles is not small, the fluid system is categorized as a dense flow and you are required to take a different modeling approach. It is important to realize that, with the particle tracking approach, particles do not displace the fluid they occupy. In a sparse flow, the continuous phase affects the motion of the particles, but not vice versa. This is often referred to as “one-way coupling”. When modeling such a system, it is usually most efficient to solve for the continuous phase first, then to compute the trajectories of the dispersed phases. In a dilute flow, the continuous phase affects the motion of the particles, and the particle motion in turn disrupts the continuous phase. This is often referred to as “two-way coupling”. In order to model this effect, you must compute the continuous phase and disperse phase simultaneously. Thus, the computational demand is significantly higher when modeling dilute flows than when modeling sparse flows. Add auxiliary dependent variables to compute particle mass, spin, etc. The magnetic field surrounding a coil is used to focus electron beams. The particle trajectories in the magnetic lens are computed using the Particle Tracing Module. If you are interested in magnetic field simulation, or modeling the motion of large quantities of discrete particles moving under the influence of forces generated by a background field, this video is for you. The Magnetic Lens model presented in this video can be downloaded from our Model Gallery. This is Chapter 1 of 2. Watch Chapter 2, Simulating a Magnetic Lens: Postprocessing. This model demonstrates the use of optical tracing for studying optically large gradient-index structures with anisotropic optical properties. Additionally, the model introduces a smoothing technique for handling discontinuities of refractive index on curved surfaces, which are typical in conventional optical devices such as lenses. This model computes the trajectory of an ion in a uniform magnetic field using the Newtonian, Lagrangian and Hamiltonian formulations available in the Mathematical Particle Tracing interface. Transport which is purely diffusive in nature can be modeled using a Brownian force. This model shows how to add such a force in the Particle Tracing for Fluid Flow physics interface. Particle diffusion in a fluid is modeled with the diffusion equation and the Particle Tracing for Fluid flow interfaces and the results are compared. This tutorial model shows how to add customized particle-particle interaction forces. In this example the gravitational force between 2500 stars in a galaxy is modeled. The galaxy initially rotates as a rigid body, then begins to change shape due to gravitational forces.